The landscape of dating. Over the past 20 years or so, as town centers completely destroyed by bombs in World War II in Eastern Europe have been, over time, stone by stone, restored. In my lifetime, and in the lifetime like the contemporary artist I met, who was three years younger. Her family had left and had spent their time elsewhere during the Reconstruction. In the sign of the times, the woman still looks like a a cheerful hippie, with a restlessness on display, over time perhaps becoming more visible. Getting perspective from an artist who liked to paint landscapes of the far off, and generally avoided the things up close. The divorced mother, now at war with her son, looking for a lasting relationship, talking with great honesty about her life on Yom Kippur. To me. After being banished from the territories in the 1980s, with an art degree from the University of Illinois in Champagne, she had gone to San Francisco. She landed in Minnesota in 1982, where she remains. When she married in 1991, she said that she knew on her wedding day she had made the wrong decision. Her marriage lasted until 1997, with six years of marriage counseling. Her husband, she said, was shocked when she asked for a divorce. At the time she had two kids, the youngest having been born in 1994 . Unsettled. To tackle the deeper problems, with perspective, after a deep sleep, of the daughter of Ukrainian Jews who had never returned home to Chicago. The woman who seemed on Yom Kippur to want to come to grips with her sins. The main one concerning that she never really had loved the father of her kids. Perhaps not knowing about “the last clear chance doctrine” to be used in her own defense. On issues of contributory negligence, in her life. People do not really say, to strangers, what is most true, like this. Living day to day, struggling economically ever since her divorce, making a living as a sign painter. Recognizing all of the restlessness, in her story of detachment. At a time when clearly, with perspective of time, she had not really known herself. THEN the remark of a stranger recognizing her for her modeling for his art class, naked. This was, most likely, no big deal for an art major, though the stranger hovered over our table way too long. The landscape artist who bared her soul to me in an Irish bar, owned by a Brit, about what she hopes to be building upon. Six years ago she had become Christian, with no mention on how that affected her relationship with her kids. Having gone to Guatemala to build homes, the divorced mother with one daughter away at college, with her church group, in her restlessness. But now at war with her high school age son who lives with her – perhaps playing the game by something other than the official rules – but he would be asked to leave when he turns eighteen. The divorced mother, hoping to build on a lasting relationship, talking with so much honesty about her life on Yom Kippur. Giving me the once over. Just once, in this Irish bar that was not really Irish, with bagpipe music airing. Despite her claim of being an artist, who now liked to take commercial jobs closer to home but with her free time she likes to paint landscapes of the far off, generally avoiding the things up close. Expecting pain in any relationship, expecting such little joy. Life in Minnesota. People want to live here; they don’t want to leave. We don’t have high turnover. After a provided quote from me by another landscape artist –“I have always worked and pulled my hair out simultaneously, but the higher motivation is the sheer pleasure and joy found in the depths of perceptual engagement.” — she then said she did not want to see me again. Perhaps coming to learn, in her continuing education, that that you could not love others, until you settled first upon really a known self, before moving on. After giving me the once over, moving to the the art of loving yourself. 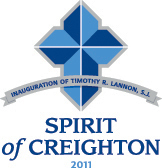 September 30, 2011 speech of Christine M. Wiseman, J.D., president of Xavier University of Chicago, at the inauguration of the president of Creighton University: “It is a privilege to offer these greeting at this moment in time to a man who long ago captured my intellect, at an institution which long ago captured my heart. At an institution where scholars can gather to challenge the norms in science of the past; where students are free to challenge those who declare that Truth exists only in what has been and leads no room for what might be; at a place whose students are free to challenge the world over what is unjust. At an institution where the church does Her best thinking, where theologians continue to explore the meaning of Truth, but their theories and ideas are contextualized by a people of faith, unlike in the marketplace of ideas. At a place with an identity being Catholic whose people can challenge the Truth about what exists — in what has been — for what might be. At an institution whose identity is both Catholic and Jesuit, of greater complexity than any other Jesuit university in this country, in disciplines and majors where students will understand that learning must encounter human suffering. Where learning about human success involves learning about human pain. Where learning about conquerors must involve learning about the conquered, where learning about rule-makers must involve learning about the exploited, where learning about leaders and their ideas must involve learning about the marginalized and the poor. For this is the obligation of mercy and it will forever be necessary for students who must respond creatively with some idea to a world in need of healing. Just as it will be necessary to a world which must respond with the hopefulness described by Flannery O’Connnor as characterized through Jesus as one who looked at the world and saw it as a place worth dying for. In a catholic institution whose reach is global. Welcome to the challenge at this place, in these times. In this place it is one thing to educate women and men of all races and ethnicities and to lead each other, and it is another to afford them the opportunity. We who are here with you today come to offer our support. With a Bachelor of Arts and Juris Doctorate from Marquette University, upon graduation Christine M. Wiseman went into the field of law, serving as a law clerk for the United States District Court, Eastern District of Wisconsin, an Assistant Wisconsin Attorney General with the Criminal Appeals Division, prior to her academic career. Wiseman, in nearly 30 years in Catholic higher education, has served as a law professor and administrator at Marquette University, professor of law at Creighton University and then vice-president for Academic Affairs at the Jesuit University. Most recently she was Professor of Law and then the provost at Loyola University of Chicago before becoming the 19th president of Saint Xavier University.